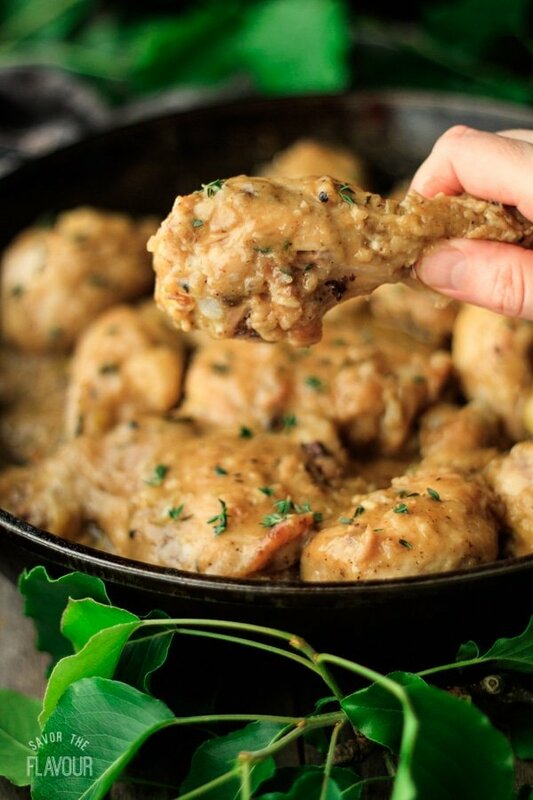 Southern smothered chicken with homemade gravy is a popular low carb comfort food served in the South. Traditionally made in a cast iron skillet, it will quickly become a family dinner favorite. Use drumsticks, thighs, or backs to make this simple meal idea. Southern smothered chicken is a popular Southern comfort food. If you’re from the South, you might have grown up eating this dish on Sundays as the special meal of the week. You might be used to having your chicken cooked with onions only, or maybe your Mom threw in other vegetables like celery, green peppers or carrots. Either way, the vegetables you choose play an important part not only in the nutritional value of this dish, but also improve the overall flavor. Smothered chicken is covered with a rich, homemade gravy, which is made from the fat drippings after the chicken has been browned. I’ve used chicken stock to make the gravy, but if you’d like a white gravy, you can also add in milk. 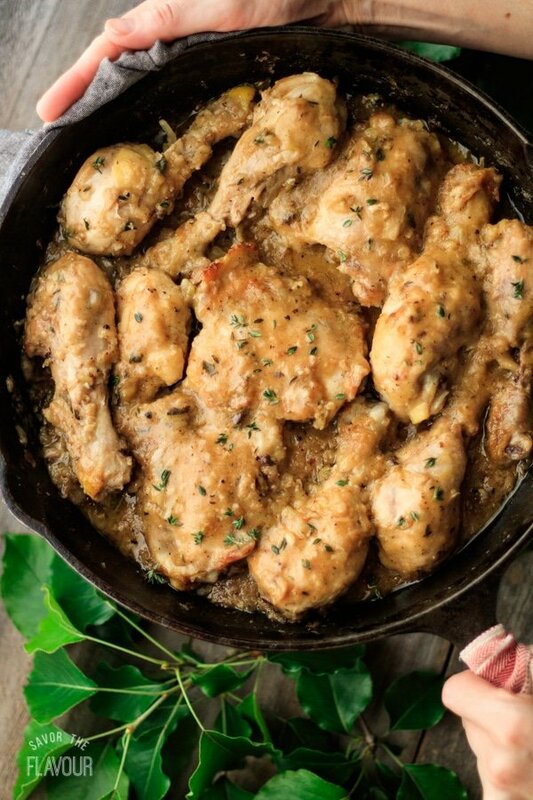 Traditionally, smothered chicken is made in a large cast iron skillet on top of the stove. Some cooks say it improves the flavor, but I’ll let you be the judge. Actually, this chicken recipe is an easy version of the French chicken fricassee. Serve your smothered chicken with Southern sides like our collard greens, skillet cornbread and sweet tea. Want a white gravy? Add 1 cup of milk after the gravy has cooked for two minutes, then cook for three minutes. Want more vegetables? Add green pepper and carrots with the celery and onions. Want other spices? Try garlic powder and smoked paprika. Want a different garnish? Substitute fresh chopped parsley for the fresh thyme leaves. Here’s some other delicious Southern food your family will love to round out this meal. Skillet Cornbread: a crumbly, slightly sweet cornbread that’s easy to whip up for dinner. Southern Collard Greens: smoked ham hocks flavor this addictive and nutritious side dish. Southern Sweet Tea: learn how to make sweet tea like a real Southerner with this super-easy recipe. The pleasure of a 5 star review of this southern smothered chicken recipe would be greatly appreciated. Rinse the chicken pieces in cold water, then pat dry with paper towels. Set aside on two large plates. In a 9×9-inch pan, place the flour and seasonings. Mix well. Chop up the onions and celery, then mince the garlic. Set aside. Melt the butter in two large skillets over medium high heat. Dredge the chicken pieces in the flour-spice mixture and shake off the excess flour. Reserve the leftover flour mixture for making the roux. Place 6 or 7 pieces of chicken in each skillet, making sure they aren’t touching. Brown the chicken by cooking it for 5 minutes per side, until the skin is golden brown. Adjust the temperature if necessary. Drain chicken pieces on paper towels. Pour off the fat from the two skillets into a bowl, then add 4 tablespoons back into each skillet. Divide the onion and celery between the two skillets. Saute with a sprinkle of kosher salt and black pepper for a 5 to 7 minutes, then add the garlic. Cook until fragrant, roughly 2 minutes. Lower the heat to medium. Add 3 tablespoons of the reserved flour mixture to each skillet to create a roux. Whisk the flour with the fat and cook for a minute. Slowly add the 1 1/2 cups of chicken broth to each skillet while constantly whisking to prevent lumps. Cook the gravy for two minutes. Add the browned chicken pieces back to the skillets and coat each piece with the gravy. Cover the skillets with lids to speed up the cooking time and to prevent the gravy from reducing. If you don’t own a lid big enough to cover your cast iron, cover your skillet with aluminum foil. Turn the chicken once while the chicken is simmering on top of the stove. If necessary, add 1/2 cup chicken stock to the gravy in each skillet. Over medium low heat, cook for 40 minutes, or until the chicken is falling off the bone. The meat thermometer should read 165 F when inserted into the thickest part of the meat. If you prefer, you can place your covered cast iron skillet in a 350F oven for 35 to 40 minutes. Garnish with fresh thyme leaves. Serve warm over rice, mashed potatoes, or with a crusty bread to sop up the gravy. The pleasure of a 5 star review of this Southern smothered chicken recipe would greatly be appreciated. This was very simple and simply delicious! A family winner! Fantastic recipe! !